Since the beginning of this year, we’ve been torturously teased by the upcoming release of the new Lamborghini Aventador SVJ and we’ve all seen the photos of it in its camouflage zentai suit. Now it’s finally here! But before you get ahead of yourself, they’re pretty much all sold out, so you’ll only be able to enjoy the new specimen by gawping at it in the latest photos and videos - unless you’re one of the lucky ones that bought it for north of a jaw-dropping £400,000 (the price we expect it is). New footage will be released over the following days as the Monterey Car Week comes to an end (more info on this later). The ‘SVJ’ in the new Lamborghini Aventador stands for Super Veloce Jota. Whether or not you have any knowledge of the Italian language or previous Lamborghini models (Aventador SV), Super Veloce is directly translated as, you guessed it, ‘Super Fast’. The meaning of Jota, however, isn’t so transparent. Quick history lesson: Jota has Spanish origins and ultimately refers to a race spec car. Lambo lovers will recall the one-and-only Miura P400 Jota, developed by engineer Bob Wallace back in 1970, and then the Lamborghini Diablo Jota in 1995. Bringing back the Jota name for their latest Aventador model is reminiscent to say the least! Visually, the SVJ is noticeably different from the plain old (ha!) Lamborghini Aventador S.
Last month, Lamborghini’s new beast blew Porsche out of the park on the Nürburgring lap in Germany, having a record lap time of 6:44.97 - while the Porsche 911 GT2 RS achieved 6:47.3 in September 2017. Improving the SVJ’s performance is the active aerodynamics system. Additionally, in the front splitter of the car, there are flaps that operate to either fully increase the downforce or interfere with the flow of air. The four-wheel-drive system, suspension, rear-wheel steering, seven-speed paddle-shift gearbox, stability and traction control have also all been improved to up the performance. Aside from these new modifications, the Aventador SVJ marks a pretty big moment in Lambo history, as Lamborghini confirmed it is their last model to have a non-hybrid V-12 engine. There are rumours that the future Lamborghini with a hybrid V-12 engine will make an appearance around 2022! Monterey, California, is seeing all the latest, most expensive and incredible new cars throughout this week. 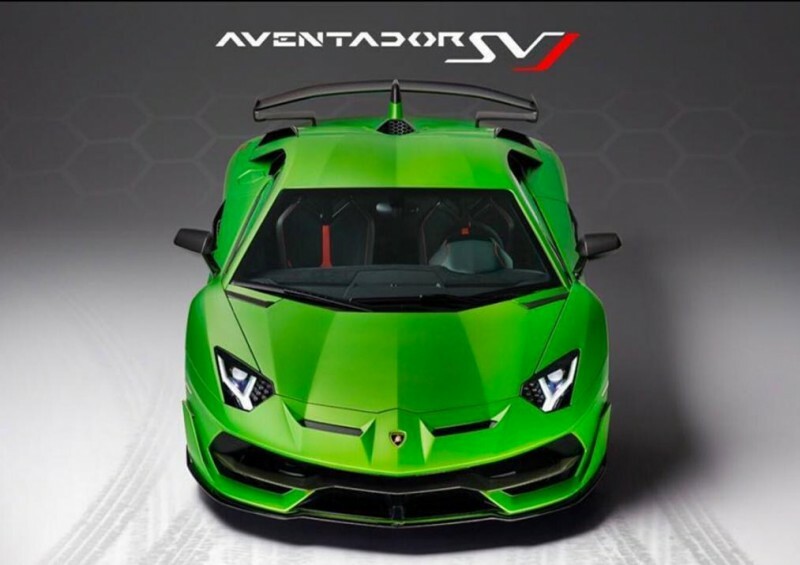 The Lamborghini Aventador SVJ will be fully revealed at this event in all its glory, so photos and more info on the new model will soon appear online. The celebration of automobiles finishes this Sunday at the Pebble Beach Concours d’Elegance, so for more detail and footage, hang on to your seat until then if you can!